Q. Bonney, you were named Executive Director of the Nevada Humane Society (NHS) last February (2007). What was the organization like when you arrived? A. The facility was modern. A year before I came on board, NHS and Washoe County Regional Animal Services had moved into a brand new building (NHS is in one half, Animal Services is in the other). However, there hadn't been consistent leadership at NHS for several years. A long term Executive Director had left two years prior, and three interim directors had taken over in the meantime. Over that two year period, a shift on the Board of Directors had also taken place. An active member of the local rescue community had gotten on the Board and helped change its direction toward more lifesaving. The Board hired Nathan Winograd of No-Kill Solutions to perform an organizational assessment and search for a new Executive Director. Q. What was priority number one for you? A. The first thing I focused on was changing the culture and making lifesaving a priority; getting animals out alive and decreasing the number of animals coming in. All of our decisions come from and are guided by this. Q. What specifically did you work on at first? A. Two things: implementing new procedures, policies and protocols, and building the right team. A commitment to no-kill requires people to work harder and go the extra mile to save lives. This isn't everyone's cup of tea, and many people quit. I hired several new staff who had experience with and a commitment to lifesaving. Ultimately, we did a complete management overhaul. Q. What sorts of procedures, policies and protocols did you change? A. We changed almost everything. We rewrote all of our job descriptions to put more emphasis on life-saving. Kennel attendants became animal caregivers, for example. We changed adoption contracts to eliminate negative, punitive sounding language such as, "we don't adopt to people who......" We changed our volunteer policies. Before, there had been a list of things volunteers couldn't or shouldn't do. For example, volunteers weren't allowed in cat rooms without a permission slip and so on. Now volunteers and adopters are encouraged to enter communal rooms and interact with animals. And we made some major changes in life-saving protocols. Cats with ringworm and dogs with food aggression are no longer routinely killed, for example. We also made major improvements in customer service to encourage more adoptions. We extended our hours. Staff stay until adoptions are completed or until people are ready to leave, instead of closing right on the dot. We're open every holiday except two - we do a lot of adoptions on holidays because people are off. We lowered adoption fees from $95 to $50 and gave a lot more leeway to managers to make special deals for special needs animals. In general, the atmosphere in the shelter is very different-the staff and public have noticed and commented on how friendly and pleasant the environment is now. Q. Have you added new programs? A. For one thing, we now spay and neuter before adoption. 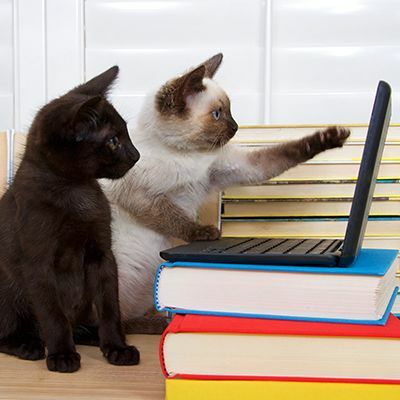 To keep more pets in their homes, we started a Help Desk for animal behavior problems. We are currently getting 300 calls and e-mails per week. We just started a pit-bull spay/neuter program that pays people $5 to fix their pit bulls, and already, we have a wait list of 200. This program is so important because most of the dogs we euthanize are pits. And because 40% of the cats we euthanize are ferals, we've started a barn cat program. We're also talking with animal services about referring feral complaint calls to our Help Desk for mediation, rather than picking them up and bringing them into the shelter. Q. You mentioned that you share a facility with Animal Services. What is your relationship like? A. Our relationship with the County is excellent. The County program is very well run and they are in sync with our goal of achieving a no-kill community. Animal control staff work hard to reunite animals in the field so they don't have to bring them into the shelter - for example, all officers are equipped with scanners to look for microchips while they're out on patrol. If they pick up a dog, they leave posters in the neighborhood. They work with TNR groups to return ear-tipped cats to their colonies and they do feral surgeries in their clinic two days a week. Here's a great example of how we work as a team: officers gave us a heads up recently when they picked up forty five orange cats from a collector. That has given us time to plan for an "orange cat special." Q. Have you made significant inroads in achieving no-kill community status since you arrived? A. From January, 2007 through August, 2007 our community euthanasia is down 54% for dogs and 41% for cats. adoptions are up more than 70% for dogs and 100% for cats over the same period in 2006. Our live release rate for the first eight months of 2007 is 91.8% for dogs and 72.8% for cats. I think one thing helping to drive our numbers is that we now set monthly adoption goals. For August, the goal was 800 - we exceeded it by three. Goals excite the staff, public, and volunteers. Q. How has the community responded to your new emphasis on lifesaving? A. The response has been overwhelming. We've gone from 25 to 900 shelter volunteers and from 12 foster families to 220 foster families - without really trying! People are flocking to join our lifesaving mission. We have new volunteer dog walkers and cat socializers. There are teams who post animals on Craig's list and volunteers who make posters of animals needing homes. Volunteer carpenters have made new cat trees for communal rooms. One couple knits and crochets dog and cat beds - they made 100 in one month! Volunteers help clean the kennels, groom the animals and take photos. We try and give our volunteers meaningful jobs, a lot of responsibility and a welcoming environment, but I think what drives many of them is the peace of mind knowing that the animals won't be killed. A. My main goal is to get the community live release rate over 90%. We're there for dogs at 93%, but we still have a ways to go for cats. Bonney Brown is the Executive Director of Nevada Humane Society in Reno, Nevada. She is a former Chief Operating Officer for Best Friends Animal Society in Kanab, Utah. She also served as Best Friends' Communication Director and National No More Homeless Pets Director, and as the Campaign Director for Alley Cat Allies, a national feral cat advocacy program. She has written several manuals on grassroots fundraising and management for humane organizations, and is a speaker on these topics. In 1992, Bonney founded Neponset Valley Humane Society in Canton, Massachusetts, and served as the organization's Executive Director for seven years, served as Vice-President of Doing Things for Animals for two years, and edited the first editions of the newsletter No-Kill News.